Many veterinarians and animal behaviourists believe that if owners knew about the potential risks of declawing and were educated about the alternatives, few would choose this surgery. Veterinarian Jean Hofve notes that when veterinarians do disclose the risks and discuss non-surgical alternatives, 75%–90% of those who were seeking declaw surgery for their cats change their minds. Unfortunately, some veterinarians do not warn their clients about potential physical complications or behavioural problems, or discuss non-surgical alternatives. In fact, many don’t even inform their clients about the true nature of the surgery, which involves not just removal of the claws, but also amputation of a portion of bone from each toe. This leaves many pet owners believing that the surgery involves nothing more than a simple removal of the claws. For those who are concerned about furniture damage or potential harm to people from cat scratches, there are a number of humane alternatives to declawing. Soft Paws (also known as Soft Claws) vinyl claw caps, available in a variety of sizes and colours, enable cats to scratch without harming furniture or people. The caps are glued onto the claws, and a set lasts 4–6 weeks. A package with 4–6 months’ worth of claw shields can be purchased for $16–$19. The sharp tips of a cat’s claws can be trimmed without causing pain or trauma (for those who wish to view the procedure, there is an instructional video). Claw trimmers can be purchased inexpensively from most pet supply stores. To trim a cat’s claws, squeeze each toe gently to expose the claw, and cut off the sharp point at the end, making sure not to cut into the pinkish bit at the center near the base of the claw (cutting this portion will cause pain and bleeding). There is a product called Emery Cat Board, a scratching board that files down a cat’s claws while he scratches voluntarily. The product costs around $20, depending on where you buy it. 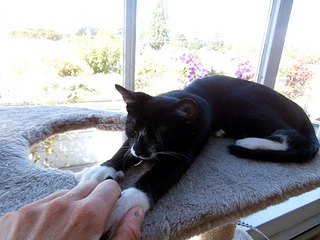 Scratching is a natural and necessary behaviour for cats, so it is important to provide an outlet for this need. There are scratching posts available in most pet supply stores, and those who enjoy building things can easily make their own (see How to Make Cat Trees, Beds, and Scratch Posts for free instructions and patterns). A scratch post should be sturdy enough that it won’t fall over, long enough for the cat to stretch out while scratching, and free of toxic materials. Otherwise, there are no rules – it can be as big and fancy or small and subtle as an owner prefers. The cheapest scratch posts commercially available are made out of corrugated cardboard, and most cats love them. An old log or tree stump also works well, and many cats are happy to scratch a sisal doormat as well. To redirect scratching behaviour, place the post near the cat’s preferred scratching target and rub a little catnip on it. Whenever he begins to scratch the furniture, call him or bring him to his scratch post and give him a treat there to create a positive association. Doing this many times helps to change the scratching target. Attach Sticky Paws tape, tinfoil, wax paper, or upside down plastic carpet runner (pointy side up) to the favoured scratching spot and keep it there until the habit is broken. Cover the targeted pieces of furniture with blankets when not in use. Spray a non-toxic pet repellent on the scratch target, such as Grannick’s Bitter Apple or Veterinarian’s Best Bitter Cherry Spray. Use a motion-activated pet deterrent that emits startling bursts of air, such as the SSSCAT® cat repellent device. Squirt the cat with a small squirt gun or make an unpleasant noise, such as clapping or shaking a can filled with coins or rocks, when he scratches the forbidden surface. Spray a feline pheromone product such as Feliway on the scratching target. Aggression that causes cats to scratch people may be rooted in fear, anger, or playfulness, or it may be triggered by a medical problem. For information on how to determine the causes of aggression as well as strategies for dealing with it, see Cat Aggression. For information on the potential physical complications and behavioural problems that may occur after declaw surgery, see the Cat Declawing Information Page. For a full list of cat articles, see the main Cats page.